Live-action 90-second video. Recommended only for high-speed connections. TOEQUET was invented to allow players to use any croquet rules and strategy on indifferent surfaces in a kicking game - on long grass, in parks, on hilly terrain, on the beach, in forests... even on snow! We provide the wickets and the balls; you provide the toe. are the new giant-sized soccer ball wicket games you've read about in The New York Times, The San Francisco Chronicle, The Los Angeles Times, and many other newspapers and magazines. These games, played with soccer balls and oversized wickets, were created by The Toequet Company of Terre Haute, Indiana, and developed and promoted at the National Croquet Center in West Palm Beach, Florida. 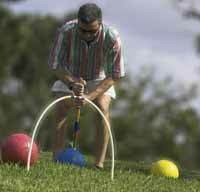 They combine the fun of Backyard Croquet with the spirit of Extreme Croquet. Everyone can play, both adults and kids. Just about anytime. Almost anywhere. Ready for extreme fun? First you need the right equipment. See our Accessories page for purchase of individual mallets, 2 mallet sets, wickets, replacement parts, and other accessories. MALLETBALL is what you get when you add a proportionately weighted mallet to the game, which then is pretty much like croquet - except the balls and wickets are giant-sized, and your potential court is all the great outdoors! Of course you can use any rules you please for Malletball, ranging from traditional 9-wicket croquet rules on a defined court to the ultimate extreme version spanning meadows, forests, beaches, and open country. ARE YOU READY FOR SOME EXTREME FUN? Fast-paced action for large groups? Leisure competition for two? First, you need the right equipment and accessories. For the kicking games, the inexpensive basics are nine wickets, two stakes, and four soccer balls – blue, red, green, and yellow. For mallets, choose the Universal or the Monster. For a party or a recreational center, check out our 16-player sets, too.